A book-plate for Simpson at eBay caught my eye. 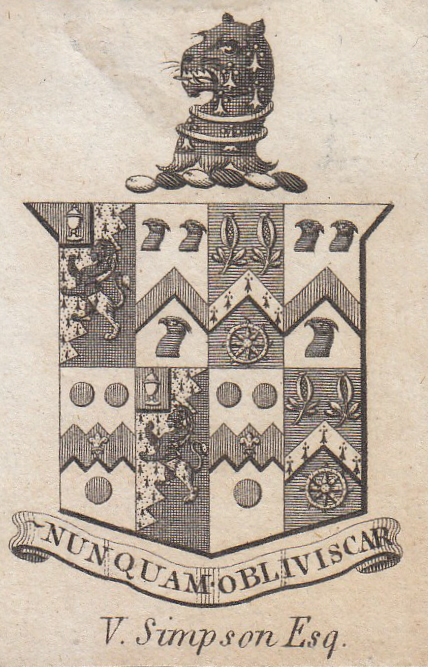 The Arms are not one I found when putting together my Simpson armorial. I had a go at working out the blazons in order to identify the non-Simpson quarters. A search through Papworth for Arms with pomegranates was fruitless. I then looked in Franks’ Catalogue of Book plates and there was an entry for Valentine Simpson of Bobbing court, Kent. His Arms were impaling those of his wife who was also his first cousin. They were married in 1778. Unfortunately, even with the quarters named I have, so far, been unable to find them listed in any of my usual heraldic publications. However, the Simpsons did donate some church plate which is recorded by the Kent Archaeological Society’s Archaeologia cantiana (Volume v. 17) and gives details of the Arms. Crest: An ounce’s head pean erased Gules collared gemellee Sable. Motto: NunQuam Obliviscar (I will never forget ).